We recently reached out to a number of community and voluntary groups from the Ballymena area where we have two offices to offer financial support with their community projects. Workspace Community Fund grants were awarded to six community projects; Dunclug Partnership, The Hope Centre, 1+1 Project, Ballykeel1 Moving Forward Community Group, Harryville Partnership Initiative and Turning Point NI. We are part of The Workspace Group, one of Northern Ireland’s leading social enterprises. The Workspace business model sees us operate commercial businesses which generate surpluses, part of which are used to fund projects in our local area such as our local recreation centre and After School Club. We also provide support directly to local community or voluntary groups to enable projects that otherwise just wouldn’t happen through our Workspace Community Fund. This reflects what Workspace is about since it was founded – helping the local community in a practical way. 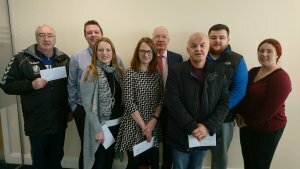 Laurence O’Kane, The Workspace Group (centre) with representatives from Ballymena community groups who recently received grants from the Workspace Community Fund.